of new build shipping containers and self-storage containers. World built around shipping containers. opportunity to go on one of the owners aircraft seen here in the pictures. new block buster movies which starts filming in October both over seas and here in the UK. 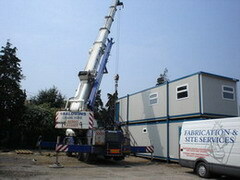 http://www.fabricationandsiteservicesuk.com and come real back soon. team that took on this task were from top aviation film specialists Shoot Aviation and Fabrication and Site Services UK. coming months and years. The photographs library show the build from basic fuselage in the containers to the build completed ready to be fitted out. The next few weeks will see this being repainted, fitted out with all the interior of a Boeing creating the first of its kind and we were there!